Thanks to Da Masta Cheef's suggestion, I've added a pistol to Hannibal to help 40K him up a bit. Fits nicely in the space available. Pistol from some CSM frame or another. Once he gets sealed he'll be ready to lead some Scythiak forces into battle. 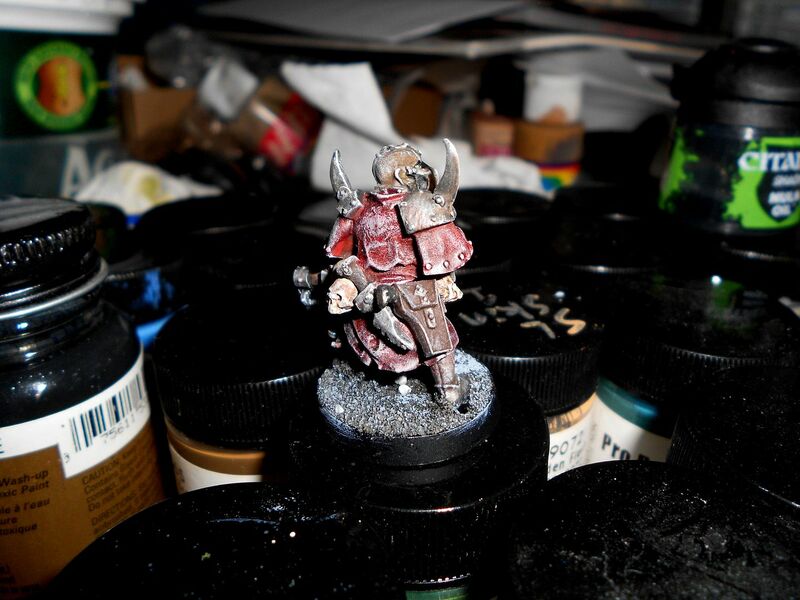 I've also begun the process of doing some regular CSM squads for the Endless Ones. I totaled up what I had painted already for them, and not counting the Word Bearers I could drag in, I have 1260-something points if I have the zerkers small enough to ride in the Land Raider with Kharn (Kharn, 9xberzerkers, 6xwarp talons, 2x10 cultists, land raider, predator, defiler). I wanted some actual Endless Ones boots on the table, so am thinking about some regular CSM squads. Plasma gun, autocannon, champ will have lightning claw and plasma pistol. Will probably go ahead and give them close combat weapons and veterans of the long war too, which brings them to taking the whole list close to 1500. 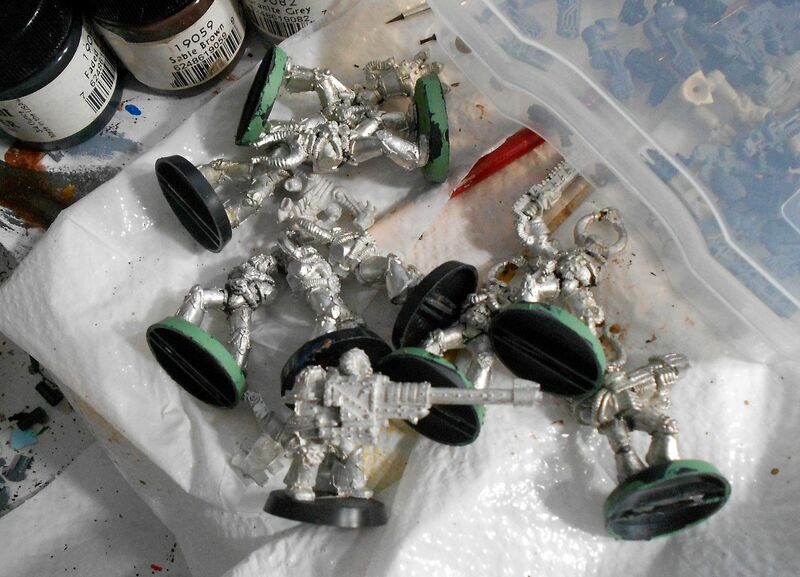 I love the various plastic CSM parts I have, plus the possibilities with combining them with fantasy chaos and various loyalist kits, but dang it I've accumulated all these piles of metal and feel I should use them! I may eventually get over my hoarding instincts and sell off some old metal guys. At least ones I have duplicates of. Well, maybe ones I have three or more of. Maybe. I plan to do both squads in official Endless Ones colors; silver and blue. Listening to The Heroic 28s talk about Space Wolves recently, I began having wolfy thoughts. A while back I had considered using Codex: Space Wolves for the Sons of Taurus, and revisiting that thought made me think of adding some wolfy allies to the Scythiak for some punch for days the Ogryn are on vacation. Soon, visions of a full blood claw pack led by a wolf priest charging out of a land raider crusader filled my head. Six hundred points of marginally effective cool. I'm trying to push these thoughts away, and am being aided by my indecision on how to model them - tie into the Scythiak somehow? Sons of Taurus? Chaotic templars? Wolfy? Mixed band of renegades? We shall see if this urge subsides or if I have another side project coming. Oog. Holstered pistol does indeed add that 40K touch to Hannibal. Good stuff. Am rather envious of your RT CSMs. Especially that one in the lower pic on the far right - one I have always wanted, but never found at the price I'm willing to shell out for. Thanks. Yeah, that guy is one of my favorites. If I recall there was an old White Dwarf cover with a pic of him on the cover. I don't know if the figure inspired the cover or vice-versa. This doesn't even scratch the surface. I think I've become more of a CSM collector than player. I want to get a lot of the old ones painted up, even if they don't see the table that often.